Larger Boxes From Warehouse Stores, Supermarkets, Or The Office Are Perfect For Packing And Moving.Used For Shipping And Storage Of Flat Shaped Medium And Large Size Items.Easy To Use And Convenient To Ship. Owing to the years of industrial experience, we have been able to serve our valued clients with a wide range of Corrugated Box. 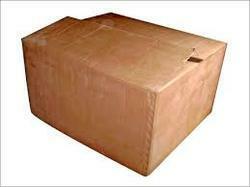 We are one of the leading manufacturer of die cut corrugated & punching boxes. Our range of products are adapted for all Industrial customers.